Multiple sclerosis (MS) is an abnormal immune-mediated process that is directed against the body’s central nervous system, including the brain, spinal cord, and nerves. It is estimated that about 2.3 million people are affected by MS worldwide. Women are two to three times more likely to develop MS as men. The disease process damages the fatty substance that surrounds, insulates, and protects the nerve fibers, called myelin. When the myelin or nerve fiber is damaged or destroyed in process a variety of symptoms including, but not limited to, muscle weakness and loss of motor function. A prevalent symptom in patients with MS is fatigue. Fatigue occurs in about 80 percent of people diagnosed with MS. Another influencing symptom of MS is a worsening of neurologic symptoms when exposed to an increase in heated temperatures, either internally or externally, called Uhthoff’s phenomenon. This can include slight elevation in core temperature from exercise or a fever, in addition to external exposure from hot, humid weather or use of hot tubs or baths. The combination of fatigue and heat-related symptoms make it challenging for patients with MS to participate in both physical therapy and general health and wellness programs. The Vasper is a new piece of rehabilitative technology that allows for low-impact, high-intensity interval training. The patient utilizes a seated elliptical with liquid-cooled, compression blood-flow restriction cuffs placed at their thighs and upper arms. The cooling apparatus helps to deter increase in body temperature, thus blunting the effects of Uhthoff’s phenomenon. The blood flow restriction cuffs creates metabolites and hormones in the body to stimulate muscle growth and repair. Emerson therapists Naseem Chatiwala, PT, MS, DPT, NCS, (left) and Kara Lammerding, PT, DPT, presented their case study on a novel treatment approach using Vasper exercise equipment for people with multiple sclerosis at the 2017 American Physical Therapy Association (APTA) NEXT Conference in Boston. 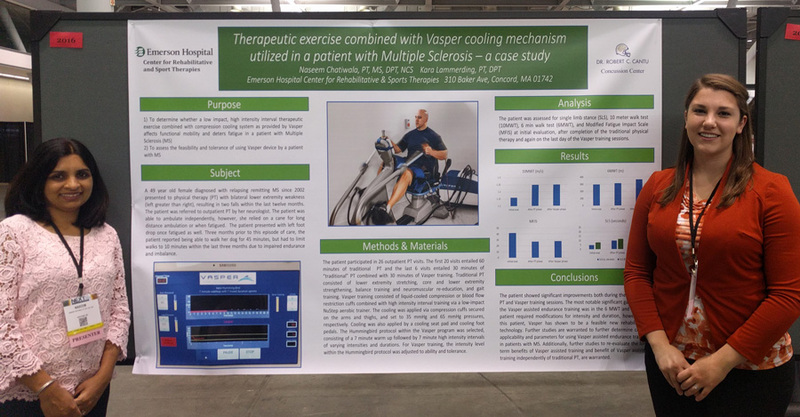 Recently, a case study at Emerson Hospital’s Center for Rehabilitative and Sports Therapies, of which was presented at the American Physical Therapy Association NEXT Conference in Boston in June 2017, evaluated the feasibility and tolerance of using Vasper by a patient with MS. The patient was able to tolerate the 20-minute high-intensity interval training protocol with some modifications and showed improvements in single leg balance and fatigue impact. The overall goal of utilizing Vasper in this study is to provide a means of physical exercise to address the deficits that occur secondary to MS and to provide a viable form of strengthening and cardio for general health and wellness for patients with MS.
Additional research is being conducted at Emerson Hospital to refine the Vasper protocol in combination with physical therapy and to evaluate its effects on endurance, walking speed, and other balance outcomes. Since the poster presentation of the case study, the Vasper MS protocol has been administered on three more patients with MS. If you are interested in learning more about the Vasper MS protocol or are interested in participating in continued research, please contact Kara Lammerding, PT, DPT at 978-287-8293 or klammerding@emersonhosp.org. In addition to multiple sclerosis, Emerson’s Center for Rehabilitative and Sports Therapies offers a range of neurological treatments for a variety of diagnoses, including stroke, brain injuries, concussion, movement disorders, vestibular disorders, and spinal cord injury. Many of our patients have complicated needs and complex histories. As an interdisciplinary team, we are able to coordinate care between disciplines and obtain appropriate services for our patients. We work closely together to ensure our patients have the outside support and equipment they need, regularly communicating with our referring doctors and ordering equipment such as walkers or wheelchairs.